TH400’s are what we cut our teeth on. We have extensive experience building the TH400 for all types of applications. We do stock rebuilds all the way up to 3000+ HP Pro-Mods. Our “stock” rebuild is strong enough for over 600 HP repeatedly yet functions like a stock transmission. Our TH400’s use exclusive proprietary parts that are only available in our builds as well as techniques that your normal transmission shop or builder is likely not aware of. We specialize in building TH400’s for forced induction street driven applications where the customer wants the comfort of retaining the automatic shifting features. Many builders don’t know how to make the trans live with boost and still shift automatically, so they recommend a full manual valve body. We have automatic shifting TH400’s in turbocharged applications approaching 1000 HP. We also cater to you Ford guys. If you need a stout TH400 for your Mustang, Lightning, or other Mod Motor or SBF, BBF combo, give us a call. We prefer you call in before ordering so that we can help you select the transmission that best meets your needs. Our Stage I TH400’s are an upgraded build. These are designed to replace a daily driver TH400 behind a stock or near stock engine and have increased service life due to our hydraulic, mechanical, and lubrication upgrades. They don’t shift brutally hard; we are able to keep them reliable by using many of the features GM designed into them. Crisp shifts at part throttle progressively getting firmer with throttle. Very streetable and very reliable. As with all Jake’s Performance transmissions, they start with a select core that is disassembled, the case is blasted clean, hot tanked, pressure washed, inspected, painted and prepped for reassembly. They also include all new friction clutches, bands, steel plates, soft parts, filter, modulator (if applicable), as well as hydraulic upgrades, bearings added at several thrust locations, and other modifications depending on power level. Although we use the build levels and options below, each transmission is custom built for the application. That is why we have a lead time. There are too many variations to try to keep these on the shelf. Large diameter input shafts and other options for 2000+HP combos are available. Call for a custom quote. Our Stage 1 TH400 is a heavy duty rebuild with valve body and hydraulic improvements, rollerized rear thrust, heavy duty intermediate snap ring, and OEM pan. 450 HP/TQ capable but proven at much higher HP levels. Our Stage 2 TH400 includes all the components in the Stage 1 rebuild but is upgraded to a 34 element sprag and the corresponding direct drum, 6 clutch direct with carbon based frictions, 4 clutch intermediate, manual/automatic valve body or forward pattern full manual upon request. Aluminum Deep pan and additional modifications. 750 HP/TQ capable. 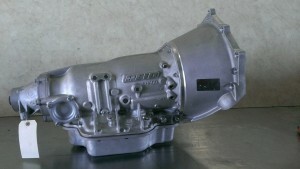 Stage III TH400 has all the features of the Stage II but includes a billet input shaft, and forward hub. Deep cast aluminum pan is standard. 1000+ HP/TQ capable. The Griner Aluminum Transbrake with or without safe neutral is an optional upgrade. $3600 400-3G10B Griner G10B "Band On"
Stage 4 TH400 has all the features of the Stage III but includes the 36 element Super Drum and alloy intermediate shaft for more reliability at power levels over 1000 HP. $4500 400-4G10B Griner G10B "Band On"
Stage 5 TH400 uses a Griner G20 billet Aluminum valve body and eliminates the intermediate sprag. Great setup for 1500+ HP combos. We’re offering a 2 speed TH400 for big power and drag radial applications. This build utilizes a new SFI case and bellhousing, aluminum direct drum, fully rollerized with several weight saving and drag reducing internal modifications, alloy input and intermediate shafts, alloy steel forward hub, billet aluminum transbrake valve body, and fabricated aluminum pan standard. Super Shaft large diameter input shaft is optional. Forward Shift Pattern (P-R-N-2-1) with safe neutral. This transmission is designed for the racer looking to maximize efficiency and reduce weight. Great for grudge racers, class racing, and anyone looking for that competitive edge. This build has become one of our most popular due to its exceptional value and approximately 20 lbs lighter weight. The base model will utilize an OEM case and tailhousing. It includes an aluminum forward and direct drum, aerospace material input and intermediate shafts, alloy forward hub, deep aluminum pan, lightened OEM ratio (2.48) gearset, ALL thrust washers replaced with torrington bearings (fully rollerized), and aluminum valve body. Options include other ratios, Reid SFI case, roller bearing tailhousing, small diameter drums, and other valve bodies. Due to the many variations in options, please call for a quote for your custom build. We offer a TH400 setup for Rockcrawler and off-road applications. This is similar to our Stage I build but uses a HD “K” case 4×4 TH400 core with a reverse pattern manual valve body that retains engine braking. We can upgrade this unit to our other level of builds as necessary for you big power off road guys. Price is $2500. This build is based on our standard Stage 2 build. It starts with a 4×4 core and HD case. We use a reverse manual valve body with engine braking, a wider 1.25″ intermediate band for engine braking with HD material. A 34 element sprag, offroad specific clutch materials, lubrication modifications, and torrington bearing upgrades are added. Upgrades are available for bigger power combos. Price is $2650. We’ve pulled out all the stops on this build. It is built specifically for the harsh conditions experienced in offroad competition. We start with a new Reid Racing case for a bulletproof foundation to prevent stress cracks and case failure common when used in rough terrain and/or with a transfer case attached. We include a Reid Super Bellhousing and a new roller tailhousing (where applicable). The next key ingredient to this package is the spragless design used instead of the typical roller clutch or sprag design used for 2nd gear. This requires the state of the art billet aluminum Griner valve body to control shift timing and includes a direct drum assembly that eliminates the failure prone sprag. An important additional benefit of this design is the extremely strong engine braking ability. Most TH400’s with engine braking rely on the OEM design 1″ wide band. This does not, it uses the entire 2nd gear clutch pack to give the same capacity and strength to engine braking as it does acceleration. Additionally we use 300M input shaft with larger splines in the forward drum, 300M alloy intermediate shaft, and billet alloy steel forward hub. We add torrington needle bearings in several key locations to deal with friction and thrust loading caused during heavy deceleration. We make several lubrication improvements, pump modifications, and other improvements to help with lubrication and cooling issues seen in offroad competition. As always, all new clutches, steels, bands, and soft parts. Clutches are specific design that we use for offroad builds. Custom length output shafts and planetary ratios are available. 6 month warranty. Pricing begins at $8000. Additional upgrade parts are available such as custom billet converters, CSR SuperShields, 2.10 or 2.75 gearsets, and various case upgrades. Visit our online store for options and pricing.